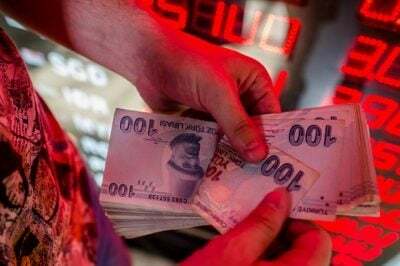 The New York Times economics columnist Paul Krugman, in a piece published over the weekend, said that the Turkish lira plunge was a re-enactment of the Asian financial crisis of 20 years ago. The increase in interest rates heavily impacts on countries, like Turkey, that took out dollar-denominated loans when they were low. As US interest rates and the dollar start to rise, the cost of servicing those loans increases, raising the prospect of bankruptcy for borrowers. Turkey has been a major borrower on international markets with a total foreign debt of $467 billion. “This looks like another example of how a combination of bad domestic economic policies turning worse and deteriorating global liquidity that makes bloated dollar-funded balance sheets vulnerable can produce high volatility and contagion. The European Central Bank has put on watch major European banks that are heavily exposed to Turkish debt. They include Spain’s BBVA, which has lent Turkey $83.3 billion, Italy’s Unii Credit, $38.4 billion, and France’s BNP Paribas, $17 billion. With the inflation rate running at more than 16 percent, international financial markets are demanding that the central bank lift interest rates to bring about financial stability and step up attacks on the working class. But this demand has so far been refused by Turkish President Recep Tayyip Erdogan. In a series of speeches over the weekend, Erdogan continued with his populist rhetoric, declaring that there was an “operation” by other countries to bring down the Turkish economy. The Turkish lira plunged by as much as 18 percent in trading on Friday, its sharpest fall since a financial crisis in 2001, and is set to fall even further when markets open. It dropped by another 12 percent in initial early morning trading in Asia, down to the 7 lira per dollar mark, with predictions that it could quickly go to 10. Erdogan has dismissed suggestions that Turkey was in a financial crisis like that which took place in Asia in 1997–98, sparked by a fall in the Thai baht, which ripped through the region with an economic impact equivalent to the effects of the Great Depression of the 1930s. The lira plunge is being exacerbated by the drive by the Trump administration to utilise the financial crisis to force Turkey into line with its foreign policy objectives in the Middle East. Last week it doubled the tariffs imposed on Turkish steel exports in response to the lira plunge and the Turkish government’s refusal to release evangelical pastor Andrew Brunson, who was arrested on espionage and terrorism charges in connection with the attempted coup against Erdogan in July 2016. The conflict over Brunson is only the latest in a series of conflicts between Turkey and the United States. Turkey is opposed to the backing provided by the US to Kurdish militia groups in Syria, which it denounces as terrorist organisations. Turkey has also come into conflict with the US and other NATO allies over its turn to seek closer relations with Russia and China. These issues were set out in an opinion piece authored by Erdogan and published in the New York Times on Friday, along with criticism of the US position in the attempted coup. Erdogan said two key aides had been killed by death squads and he would have suffered the same fate had the coup been successful. But instead of denouncing the coup in the name of “democracy” the US had only called for “stability and peace and continuity within Turkey.” Erdogan did not mention it in his comment piece, but it has been reported that he only escaped death because he was tipped off by Russian intelligence sources. Whatever the immediate course of events, the Turkish crisis and the warnings of its far-reaching implications, not only for so-called emerging markets but also for major international banks, have underscored the fact that the measures enacted by the US Federal Reserve and other major central banks did not resolve the contradictions of the global capitalist economy which erupted in the global meltdown of 2008. The lowering of interest rates to record lows combined with the pumping of trillions of dollars into the financial system produced a bonanza for the global corporate and financial oligarchy in the form of rising financial assets and stock prices. The US stock market has risen four-fold since its low point of March 2009. But this has only created the conditions for the eruption of another global crash even more devastating than that of a decade ago—a crisis which, as the experience of the past 10 years has shown, will lead to an immediate stepped- up assault on the international working class.